Growing agencies frequently have the same question: what’s the difference between account managers and project managers? And do you need to hire both? Traditionally, account managers occupied the all-important role of dealing with clients and delivering projects on time. But as agencies realized that they’re in the business of selling time, the need to separate project and client operations became clear. As a result, an increasingly large number of agencies are expanding their project management teams. Without clear roles and responsibilities, however, AM/PM conflicts are becoming common. Moreover, agencies often don’t even know if they should hire account managers or project managers. This leads to a whole mess of problems - over-hiring, duplication of effort, poorly defined workflows, and inefficiencies. This article will clear the air on account managers and project managers. You’ll learn the key differences between the two roles, their responsibilities, and how to decide who to hire. Agencies have historically been organized around account managers. They serve as the chief liaisons between clients and agency creatives. Their goal is to understand what the client wants, communicate it to creatives, and get it delivered to clients. Think of Roger Sterling or Pete Campbell from Mad Men - creative, ambitious, and highly organized people flitting from client to client and creative to creative. The account manager (AM) has traditionally been a jack of all trades. You'd expect him or her to handle client relationships, chart out a strategy, and manage projects. A skilled AM would understand pretty much every aspect of agency operations, from media and production to planning and creative. That role evolved in the '90s as agencies became more complex and organized. Project management duties were bundled off to dedicated project managers. Media buying was offloaded to dedicated agencies. This left account managers with a shorter but critical list of duties: generate revenue and develop relationships with clients. In modern agencies, the account manager acts as the primary liaison between a client and the agency. At the beginning of a relationship, the AM will work closely with a client to understand their vision and needs. He’ll also use his own experience and knowledge to chart out a strategy that can deliver on this vision. Next, the AM will communicate this strategy to his team and make sure that they deliver it on time. While he won’t manage the day-to-day operations (that’s the project manager’s job), he will collate and communicate any issues to the client (and vice-versa). All the while, the AM will also work to upsell additional services to the client to keep growing revenue. In essence, this job is a cross between sales and strategy. The AM is less focused on daily operations and more on the bigger picture. This account manager job description at Canvas8 is the perfect example. Note the use of keywords like nurture, engage, strategic, and long-term partnerships. The project management discipline was relatively underdeveloped at agencies compared to industries like construction or manufacturing. This was partly because the project management function was occupied by account managers, and partly because neither agencies nor projects were complex enough to require dedicated project managers. That's changed drastically in the last couple of decades. Increasing competition and shrinking margins mean that agencies need to extract as much value as possible from projects. In an industry where time is literally money, getting work done on time and under-budget is a huge competitive advantage. Hence the emergence of the dedicated project manager. Thus, the project manager’s brief is to plan projects and ensure their smooth implementation. While there is a client-facing component to it, project managers are mostly insulated from the relationship building duties of account managers. More than anything else, a project manager’s key function is to manage people. A PM will work with internal agency teams, client teams, outside contractors, and third-party stakeholders to get the project delivered. He’ll communicate issues, clarify doubts, and make sure that everyone is on the same page. Managing people is only one aspect of the PM’s responsibilities. He’ll also have to draw up project plans, map out work schedules, and manage risk. Creating project reports, tracking budgets, developing estimates - these all come under the purview of project managers. The breadth of the project manager’s work also depends on the agency size and structure. Larger agencies typically have a distinct account and project management roles. This reduces the amount of time PMs have to spend dealing with clients. In smaller agencies, project management and account management responsibilities often overlap. The project manager in such cases also wears the strategist and salesperson hats. On the whole, a project manager’s work is much more functional than strategic. They’re responsible for delivering projects, not growing revenue or developing relationships. This project manager job description at W.W. Norton is a good example. Note how it focuses on deliverables, delivery, and deadlines - all functional aspects of agency management. How Does an Account Manager Differ from a Project Manager? If you’ve read the above, you would know that there is a clear separation of duties between account managers and project managers. The former occupy a strategic, client-facing role in agencies, while the latter focus more on implementation and delivery. That’s the broad picture. At a more granular level, the differences are less stark. Hybrid roles, such as “producer”, complicate things further. Account managers are oriented externally. Their focus is to help clients grow their businesses with the help of the agency’s resources. The agency’s internal operations are less of concern for them; they’re primarily advocates for the client. Project managers are internally oriented. Their focus is to make the best possible use of the agency’s resources. While helping clients achieve their goals is obviously important, the top concern for PMs is to reduce wastage and improve efficiency. That is, they’re advocates for the agency. Account managers typically report to the VP of client services in small to mid-sized agencies. An individual account manager might have several account executives reporting to him. Project managers report to different people depending on the organization’s structure. If there is a PMO, the project manager will report to it. Else, he’ll report to a director-level person within his department, such as the VP of marketing or IT. Account managers are deeply involved in working with clients. They'll correspond with clients on overall strategy and deliver estimates, SOWs, schedules and status reports. They'll also have ownership over meetings, client communication, and finding new opportunities within the client's business. Project managers offload client engagement duties to AMs. They'll produce SOWs, estimates, schedules, etc. for account managers, but their work will be focused on project delivery. They can communicate with clients, but in a strong account management setup, this will be in a limited capacity. Account managers have ownership over the client side of the agency-client relationship. Thus, while they will keep tabs on the project’s progress, their primary goal is to keep clients happy and spot new opportunities, not monitor the day-to-day of the project. Project managers have complete ownership of the project, right from planning to final delivery. They’ll map project scope, draw up a WBS, track milestones, and create reports. If it affects the project, it comes under the purview of the project manager. Charting out a strategy for each client is the account manager’s responsibility. They’ll understand the client’s business and formulate an approach that can help them grow with the agency’s resources. Project managers have a limited role in strategizing solutions. Rather, they’re involved in figuring out whether a particular strategy can be implemented successfully or not. Account managers occupy a role halfway between sales and customer service. They’re not only expected to keep clients happy but to also upsell new services and expand the agency’s business. Project managers do not traditionally have a sales role in agencies. They’re focused on project delivery, not spotting new opportunities to grow the business. Account managers are salespeople, strategists, creatives, and have an excellent grasp of business. They must be strong communicators, highly social, and highly available. Good analytical, sales, and financial skills are a big plus. Project managers have to be excellent planners, delegators, and communicators. They must be detail oriented, well-organized, and proactive. 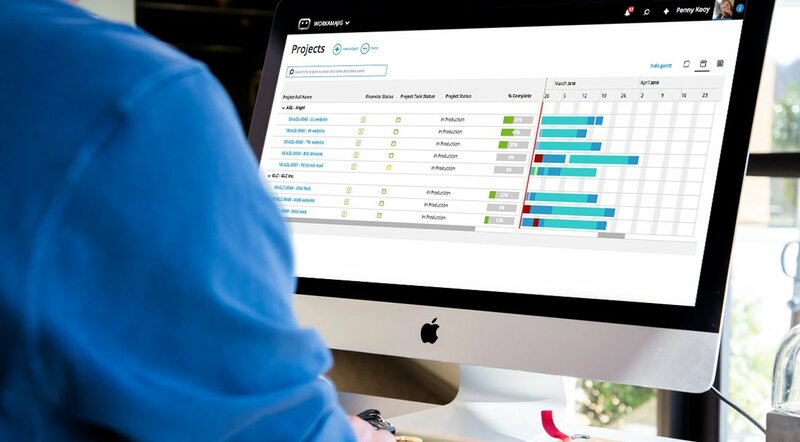 Experience with a project management system such as Workamajig is a definite plus. These are the formal boundaries for account management and project management roles. But in the real world, the boundaries are a lot fuzzier. Hybrid “producer” roles and overlapping responsibilities are common. In the next section, we’ll look at how to organize AM and PM roles at your agency. In an ideal world, you would have ample resources to hire a dedicated account and project managers. The two disciplines would complement each other and make sure that both clients and project teams are happy. But that’s not always the case. Resources are thin and sometimes you have to make do with an account/project manager with expansive responsibilities. How do you structure your agency in such cases? We’ll look at some scenarios and how to approach them below. If you have the resources, the best path would be to hire a dedicated account and project managers. The former would take care of clients, the latter would advocate for the agency. Since most agencies already have robust account management departments, your primary challenge will be implementing project management functions. Reporting: While the account manager reports to the VP of client services, the project manager’s reporting hierarchy isn’t always clear. You’ll have to figure out which department you want the PM to report to and whether you need a dedicated project director or project management office. Responsibilities: If there is no clear breakdown between account and project management duties, conflicts will arise. Make sure that both AMs and PMs know where their responsibilities begin and end. Cultural resistance: In older agencies, project management often comes under the purview of the account manager. Introducing a new PM discipline can cause some resistance. PM implementation: A dedicated PM will likely bring stronger project management rigor to your workflows. This might require some changes in work practices. You’ll have to implement this in a phased-out manner to make sure that everyone has enough time to adapt. Duplication of work: The last thing you want is both the AM and PM working on the same issues. Having well-defined workflows and responsibilities will make sure that there is no duplication of effort and overlapping duties. Often, agencies don’t have fixed AM/PM disciplines. Rather, they have hybrid roles who move across account and project management functions. In this situation, your roles would be organized around competencies and responsibilities. Producers have a fluid role in agencies, shifting easily between account management, project management, and creative duties. Their chief goal is to "produce" things. This requires mastery over three skills - understanding what the client wants, understanding what the creative can produce, and working with everyone involved until final delivery. Producers often have technical skills as well as the ability to manage others creators. For example, this producer role at Tribune Media involves writing as well as managing other writers. A client services manager is an account manager with a heavy sales orientation. Think of him as a go-between the sales and accounts departments. He’ll work with sales to respond to RFPs. And he’ll work with project teams to realize project delivery. Coordinating operations with clients, including gathering collateral, internal data, etc. Consider this client services manager opening at Future Publishing as an example. Note how it includes both sales and account management duties. Larger agencies often have different ops level roles spread across functions and departments. There might be an ad ops manager to coordinate campaigns, a product operations manager to coordinate go-to-market plans for all initiatives, etc. The responsibilities for each ops role depends on its focus. For instance, in a strategic role, the ops manager would need to understand planning and provide thought leadership. In a creative role, the manager would need to understand the creative process and advocate for creative integrity. And in a production role, he would need to understand the production process and the project's technical needs. This is a fluid role and one you would hire for when the need arises. Ideally, your agency should be organized around separate account and project management disciplines. Barring that, you can opt for hybrid roles that specialize in different cross-domain roles, as shown above. The account manager vs project manager debate is well-settled for now. The former handle clients, the latter deal with internal projects. Together, they help your agency thrive. And while you should ideally have well-defined account and project management roles, hybrid roles can often fill the gaps without adding to your overheads. How do you organize account and project management functions in your agency? Share with us in the comments below!